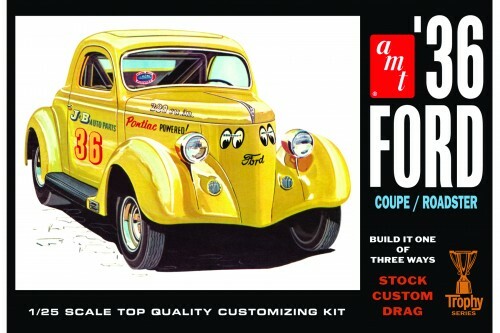 The Kats at AMT have restored the 1936 Ford tooling back to a specialized rendition of the 3-window coupe! It Features BOTH stock and chopped 3-window body options, roadster parts, chrome reverse wheels, fender skirts, customizing options and more. It’s a special Retro Deluxe reissue that includes all the best parts from the first and second issues of this modelers’ favorite kit.